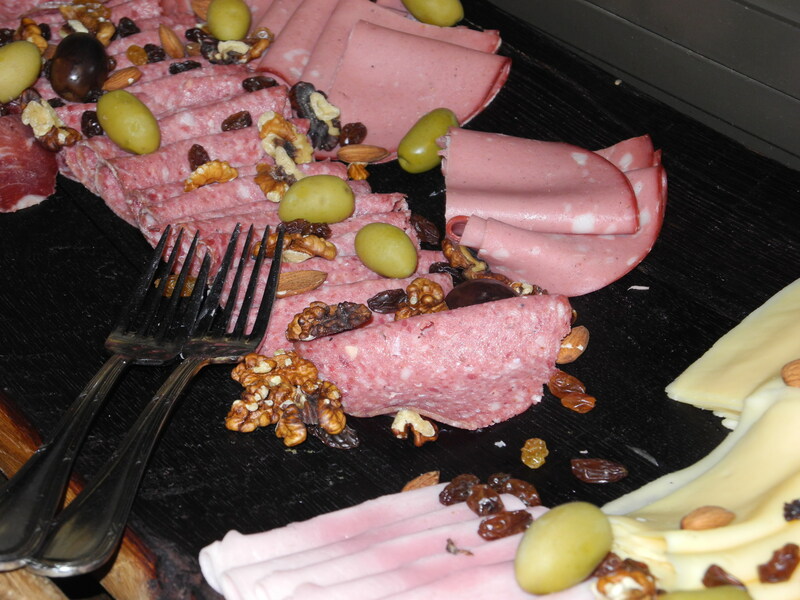 « Finding vegetables (and fruits) in meat country! 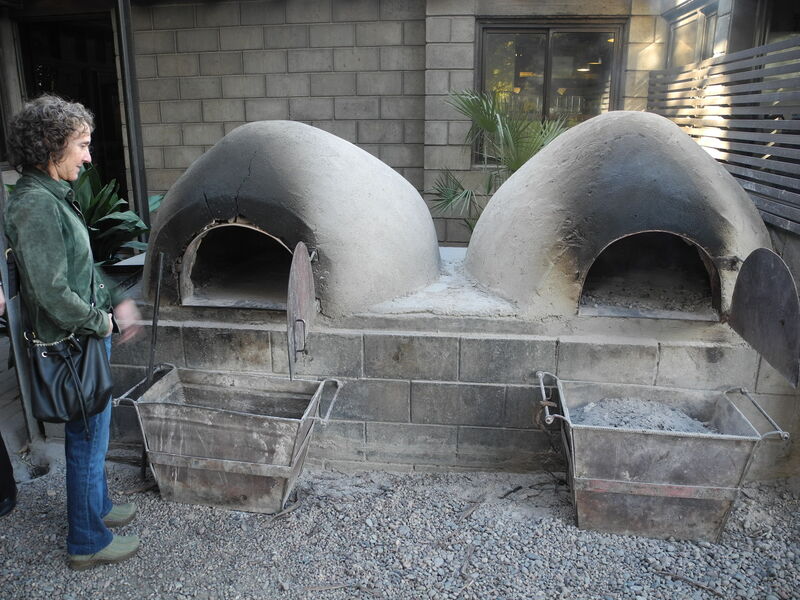 It turns out that our landlady is the personal assistant to Mr Zuccardi, owner of Zuccardi family wineries in Maipu. 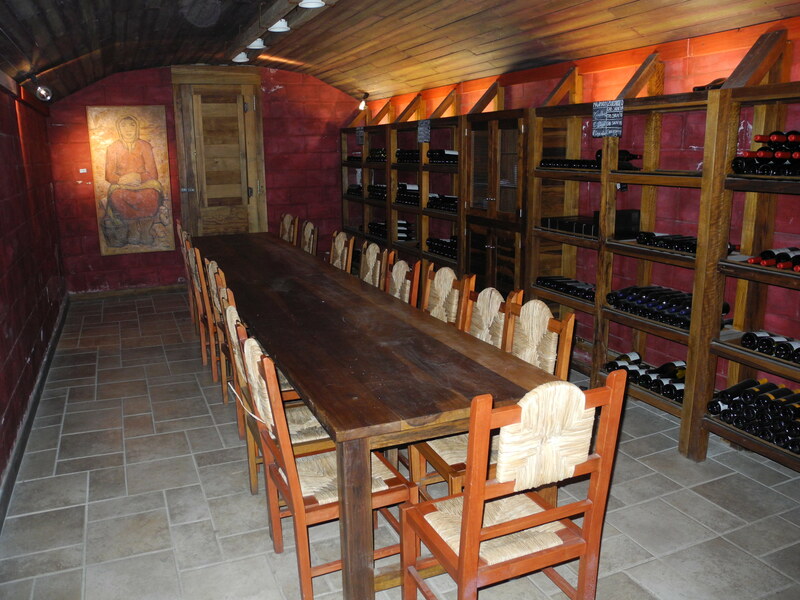 The winery sits in one of the biggest wine regions in Mendoza province-about 35 kilometers east of Mendoza city in the flat, arid fields alongside olive and cherry groves. It is winter here, so the grapevines are pruned back, and the fields look barren and gray, but beautiful in a calm and quiet kind of way. The winery has a commitment to sustainability that includes being “a company which bases all its decisions and production and commercialization processes upon a respect for the soil, the air, the flora and fauna, and the whole community”. Much like in the United States, organic certification is a rigorous and expensive process for many producers who are already using sustainable practices. 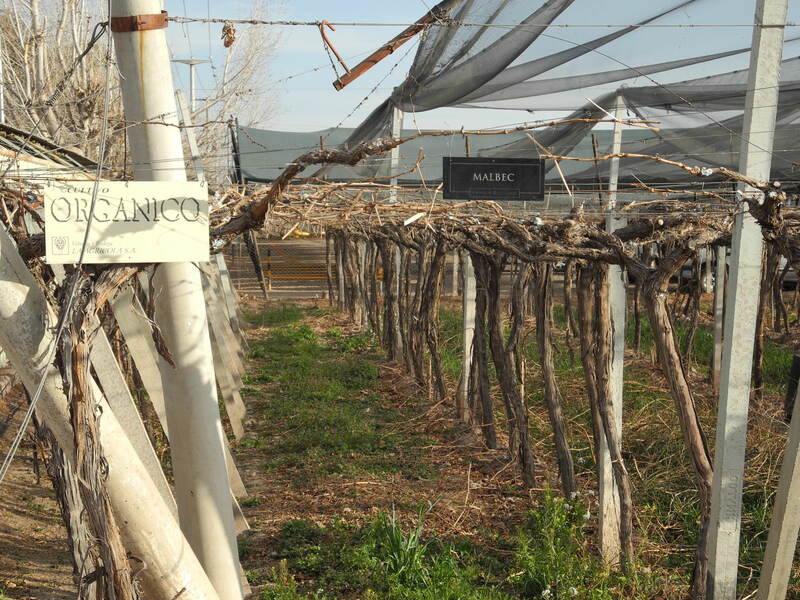 Such is the case with Zuccardi, yet 30% of their wines are certified organic. the dark sign says "malbec"
We were able to tour the production facility on a quiet Sunday afternoon. 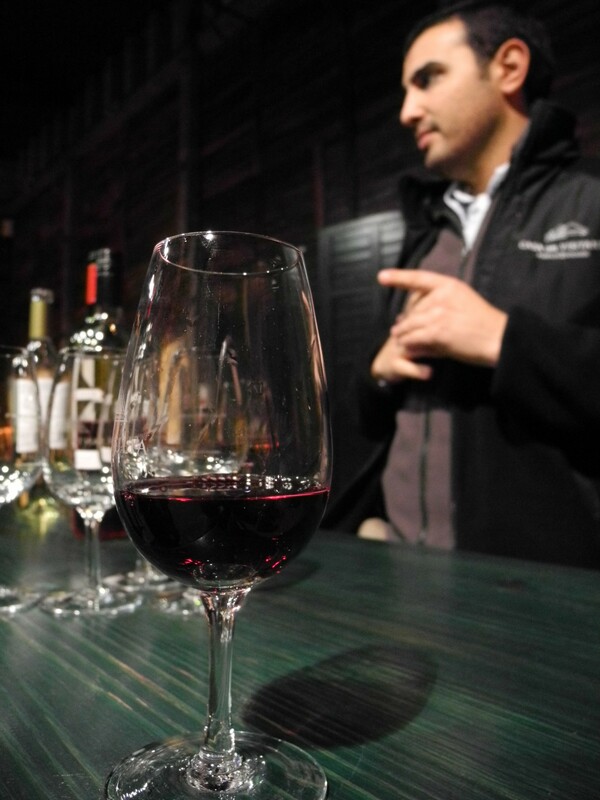 While there was no actual winemaking taking place, we learned a lot about how the various machinery works, and how much of the process is still done by hand. At the peak of production, there are up to ten people standing over the conveyor belts picking through the grapes in order to remove any over ripe, or oversized grapes. 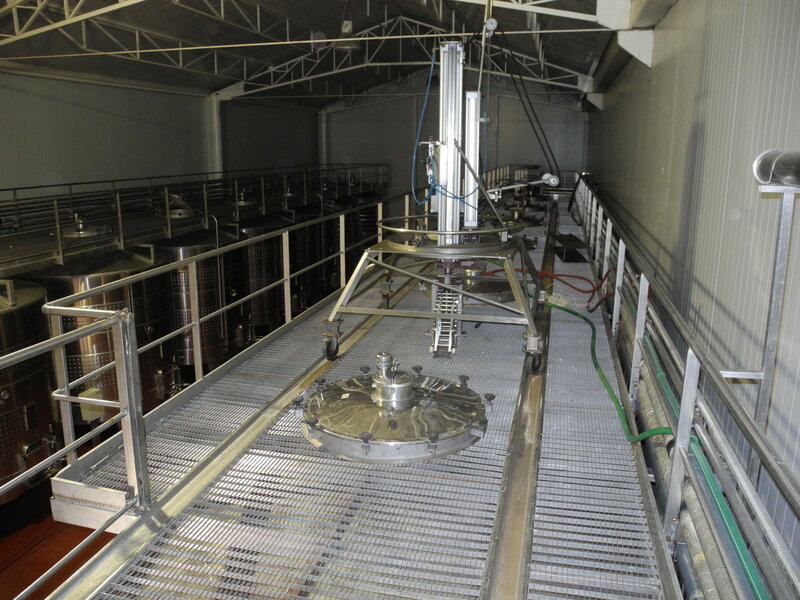 For their top level wines, they have even developed a robot that simulates the grape stomping process within the tanks of macerating grapes. And, after going through the de-stemming machine, the stems are composted and ultimately returned to the soil where the grapes are being grown. 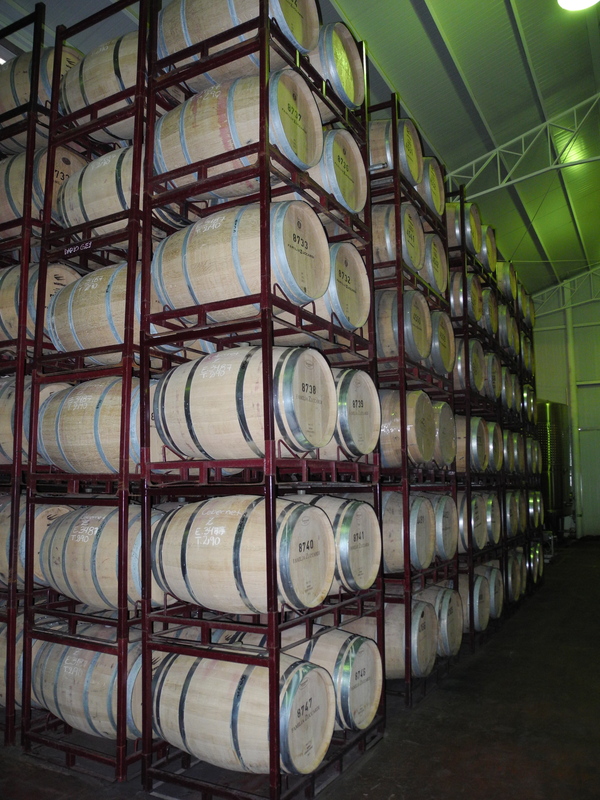 These wines are stored in fresh American Oak as opposed to French Oak, which apparently has a very different flavor. The rooms carry a delicious aroma combining the muskiness of the barrels with the sweet and slightly sour smell of the fermenting grapes. 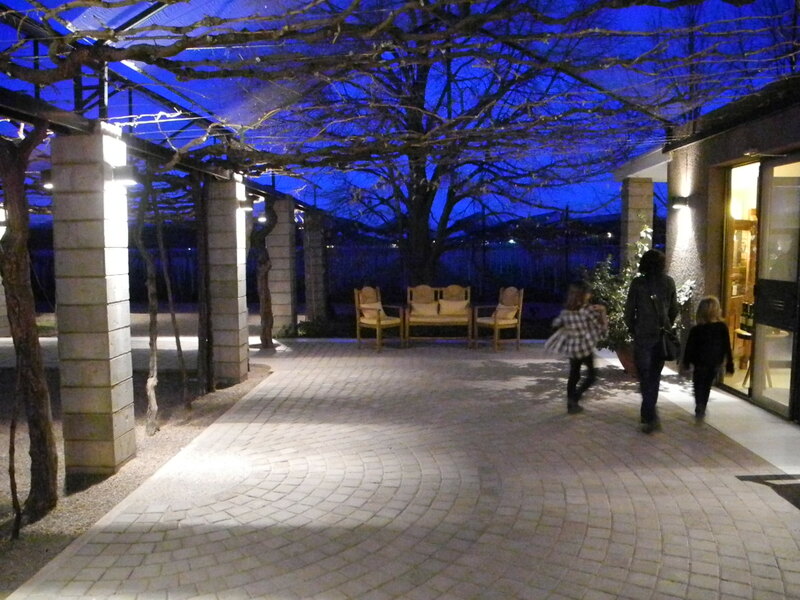 There were so many things to appreciate about this visit, from the personal attention we recieved to the beauty of the buildings, the artwork and of course, the wine. I tasted only 3, leaving many still to explore. We started with a Viognier from their young ‘Santa Julia’ line. It was lovely, grapey and light. Then we had a Petite Syrah also from the ‘Santa Julia’ line that was fruity, cool and refreshing but still complex enough to complement a light meal. And finally, while I am not an expert, their top of the line ‘Zuccardi Q Malbec’ was one of the best Malbecs I have tasted. It had a smooth almost smokey underlying scent of oak, with a full, sweet, but not overly sweet, cherry flavor. Yum. As if this wasn’t enough, we finished the visit with a “tea” at the tea house/reataurant. This is a gorgeous stone building sitting in the middle of the vineyard where lunch and dessert are prepared daily for visitors. Suffice it to say that none of us had any trouble finding one or two (or five) things to enjoy! It was a beautiful afternoon which piqued my interest and highlighted the beauty, the mystery and the skill that goes into making good wine. I am looking forward to many more explorations this year!! Sounds like a wonderful tour. Can only imagine the beauty during the crush. When is that season in Mendoza? Wonderful post. Pics are great. 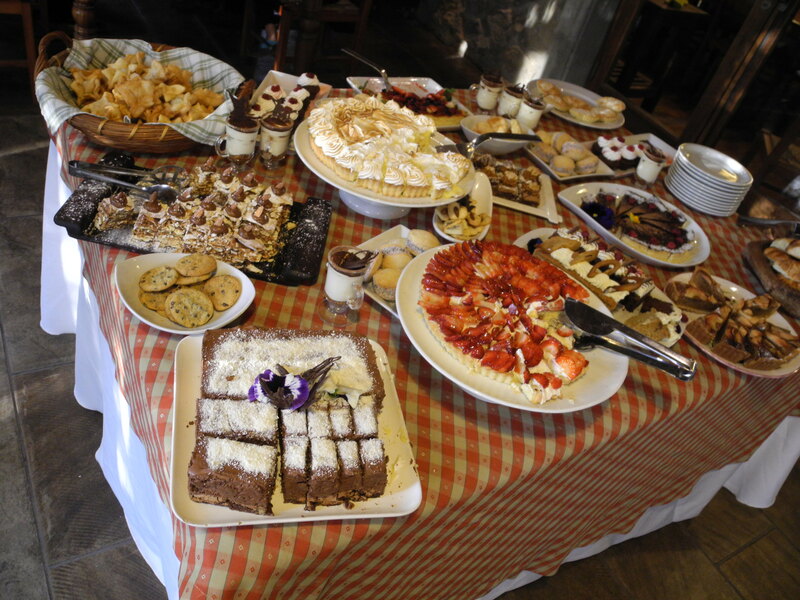 The desserts look a little over the top, especially for the middle of the day! Crush/harvest is in March and April-it sounds like it is quite a time around here! We will be leaving during Janurary/February as rumor has it it is unbearably hot, but we will be here in time for wine production…As for desserts, these people are dessert crazy. They do this midday thing right after siesta, and then have dinner around 10. They think it’s super weird that we eat dinner at 6 or 7. A whole different rhythm. Interesting, I will check this out. I was left with the impression that this was a good thing, and that it had to do with the climate where the oak comes from….I hope we are not supporting a destructive industry! 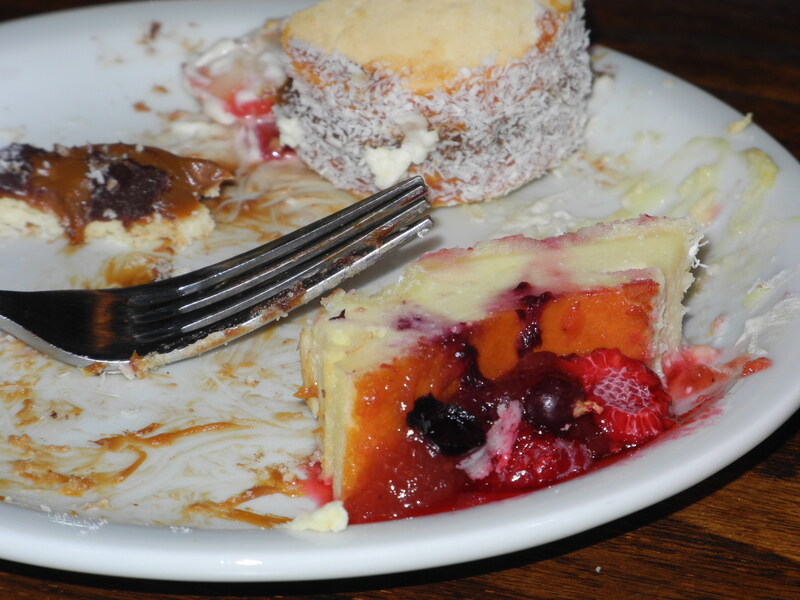 In any case, it is a treat to see and taste! Hope all is well with you!